In order to reach peak performance during competition, our bodies and minds need to be prepared and ready. What goes on between our ears leading up to the competition and during competition can make or break the result. Last week, ALP Coach, Jennifer Sharp wrote about the importance of having a solid mental game leading into a big event. She described the things she worked on and prepared for in order to win a World Track Championship. All of her preparation lead her to having an ideal Head Space during competition. What makes race day "Head Space" so interesting is that it's different for everyone. Some athletes like to be quiet and focus on the start line while others prefer to chitchat with teammates or the competition for distraction. No matter where you fall between being focused and chitchatting, it's important to realize what you need to perform your best and to be able to repeat it at each competition. Here, are 3 opinions on race day Head Space and how it was achieved day in and day out. I brought this intense focus and mental game to bike racing. I would memorize every race course and/or critical moment of a race (positioning going into a climb, last 4 laps of a criterium, the final sprint, technical corners and descents, etc) and, in my Zone head space, I could execute what needed to be done for either the team or for myself. It didn't matter how my body felt or how tired my legs were. In the Zone state, I could read the race, execute the team plan, and it seemed effortless and easy. In the Zone at the start of the 2013 Criterium National Championships. 90min later, I won the race. Now that my bike racing career is over, I can look back and honestly say my ability to achieve The Zone or Flow mental state while racing was my biggest strength. I know this because races where the Zone was fleeting, I was too. First of all, this is something very individual. Just because a certain routine works great for athlete X doesn't mean it will also work great for athlete Y. Some athletes prefer to listen to music and complete their own warm-up routine, others like the company and talking/ joking around with teammates, staff and other athletes. Still the goal is for every athlete the same: to get focused for the upcoming race and to be ready to perform. Ideally you are excited but not too nervous. You should know the race course and the team tactics/ plan (or your own plan if you are racing alone). Whenever possible you have ridden the race course in training or warm-up and you know exactly where the difficult, hard parts will be. Now, it isn't always possible to recon the entire race course but if you don't have the chance to pre-ride then you still can be well prepared with looking at maps, profiles, videos etc. Personally, I preferred to have my own routine for time trials. I made sure to know the race course, I had my own map where I added personal notes about the course. I followed my own routine with a warm-up program on the trainer and I had a music playlist that was exactly the length of my trainer warm-up. After completing my warm-up I made sure, that there was time included for one last bathroom stop, to put on my aero helmet etc. and to be at the start in time. 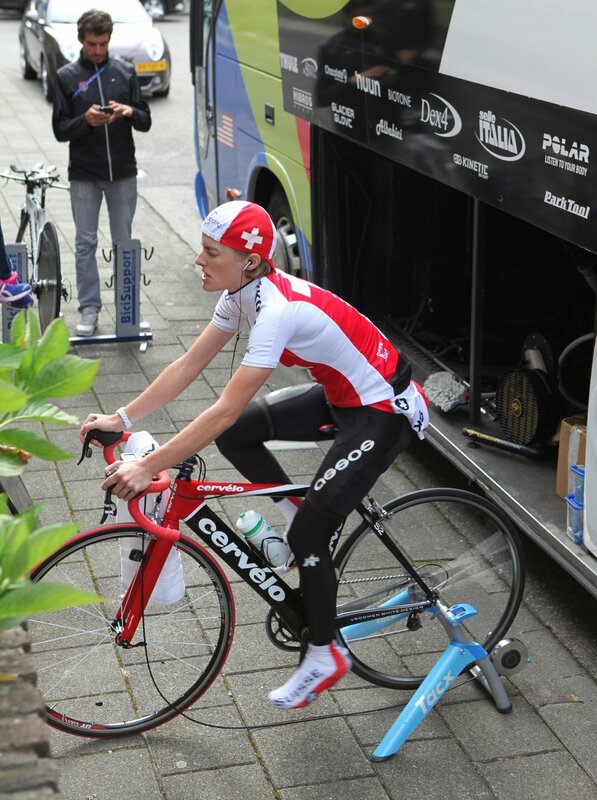 Doing my usual warm-up routine would calm my nerves and it was the perfect way to build up my focus for the TT. I tried to avoid any stress or influence from other things around me because that would make me lose my focus. For road races on the other hand, I liked to do a warm-up ride with my teammates, to pre ride the final few KM's of the race course (if possible) and to chat. It helped me to not overthink things and to stay calm. I love racing. A lot. For as long as I've been racing, I race roughly 60 times a year in both road and track. There's something about pinning on a number and bringing your best on that day that has me well into my second decade of racing. I've found my best performances occur when I dial in the details the night before: organizing my race bag with the essentials I need, figuring out the logistics of where and when I need to be at the race venue, and organizing and timing of food, hydration and recovery. I know that I prefer to be at the race 90 minutes beforehand so I can pick up my number, pin it, get a good warmup in, and show up to the line. I toe to the line confident in my preparation and training, knowing that the hay is in the barn and all I have to do is race my bike. Having those details squared away really allows me to be in the moment. I love racing at national events where the National anthem is played right before the start whistle sounds. It gives me a moment to reflect on how fortunate I am to live in a place where I can race my bike with my friends and against great competition. Gratitude calms me down before going into battle and trying to rip my own legs off. Once that whistle blows, I know it's business time and I'm ready to live in each moment, work my way to the front and stay there. Mental Training should be part of your normal training routine. Work and practice at dialing in your own race day head space.